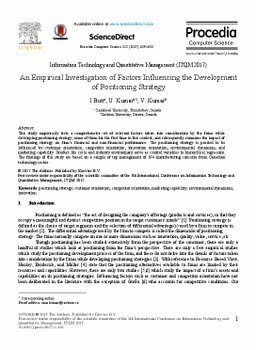 This study empirically tests a comprehensive set of relevant factors taken into consideration by the firms while developing positioning strategy, some of them for the first time in this context, and subsequently examines the impact of positioning strategy on firm's financial and non-financial performance. The positioning strategy is posited to be influenced by customer orientation, competitor orientation, innovation orientation, environmental dynamism, and marketing capability. Product life cycle and industry environment serve as control variables in hierarchical regression. The findings of this study are based on a sample of top management of 194 manufacturing concerns from Canadian technology sector.